A pipe organ is a musical instrument that produces sound by blowing air through a series of hollow tubes controlled by keyboards. Pipe organs are distinguished from reed organs, in which air causes thin strips of metal to vibrate. They are also distinguished from electronic organs that use electrical devices to produce sounds similar to pipe organs. The large pipe organs used in public buildings are by far the biggest and most complicated musical instruments ever built. A pipe organ consists of four basic parts. The console contains the keyboards, foot pedals, and stops. The pipes, which may be as short as 1 in (2.5 cm) or as long as 32 ft (10 m), produce the sound. The action is the complex mechanism which is operated by the console to control the flow of air to the pipes. The wind generator supplies air to the pipes. A very small pipe organ may have a console with only one keyboard, with each key controlling the flow of air to one pipe. Most pipe organs, however, have consoles with two to five keyboards, a set of foot pedals, and a set of stops. Stops are controls which open or close the air supply to a group of pipes, known as a rank. In this way, each key can control the flow of air to several pipes. The pipes exist in two basic forms. About four-fifths of the pipes in a typical pipe organ are flue pipes. A flue pipe consists of a hollow cylinder with an opening in the side of the pipe. The rest of the pipes are reed pipes. A reed pipe consists of a hollow cylinder, containing a vibrating strip of metal, connected to a hollow cone. The largest pipe organ in the world, located in Philadelphia, contains 28,500 pipes. The action may be mechanical, pneumatic, electric, or electropneumatic. A mechanical action links the console to the valves which control the flow of air to the pipes with cranks, rollers, and levers. A pneumatic action uses air pressure, activated by the console, to control the valves. An electric action uses electromagnets, controlled by the console, to activate the valves. An electropneumatic action uses electromagnets, activated by the console, to control air pressure which activates the valves. 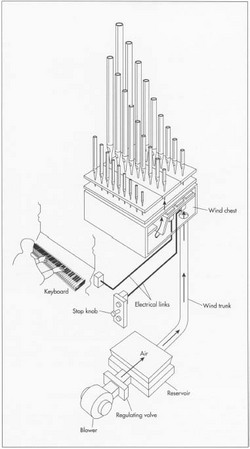 The wind generator of a modern pipe organ is usually a rotary blower, powered by an electric motor. Some small pipe organs use hand-pumped bellows as wind generators, as all pipe organs did until the beginning of the twentieth century. The earliest known ancestor of the pipe organ was the hydraulus, invented by the Greek engineer Ctesibius in Alexandria, Egypt, in the third century B.C. This device contained a reservoir of air which was placed in a large container of water. Air was pumped into the reservoir, and the pressure of the water maintained a steady supply of air to the pipes. Pipe organs with bellows appeared about four hundred years later. Medieval pipe organs had very large keys and could only play diatonic notes (the notes played by the white keys on modern keyboards). By the fourteenth century, keyboards could also play chromatic notes (the notes played by the black keys on modern keyboards). Keys were reduced in size by the end of the fifteenth century. By the year 1500, pipe organs in northern Germany had all the basic features found in modern instruments. Germany led the world in organ building for three hundred years. Pipe organs fell out of favor during the eighteenth century, when orchestral music became popular. During the early nineteenth century, reed organs, which were smaller and less expensive than pipe organs, began to be used in small buildings and private homes. The increased availability of relatively inexpensive pianos in the early twentieth century, followed by the development of electronic organs in the middle of the century, led to the demise of reed organs in Europe and the United States. Small reed organs are still used in India. Meanwhile, a renewed interest in pipe organs appeared in the middle of the nineteenth century, led by the French organ builder Aristide Cavaille-Coll and the British organ builder Henry Willis. These new pipe organs were better suited to playing orchestral music, greatly increasing their popularity. The twentieth century brought the development of the electronic organ. The earliest ancestor of this device, known as the Telharmonium, was invented in the United States in 1904 by Thaddeus Cahill. This instrument weighed two tons (1800 kg) and was not a success. The first successful electronic organ was developed in France in 1928 by Edouard Coupleux and Armand Givelet. One of the most successful early electronic organs was the Hammond organ, invented by Laurens Hammond in 1934. Pipe organs are primarily made of wood and metal. Wood used to make parts of the organ which are not visible, such as the action, may be made of plywood or soft woods such as poplar. Visible wooden parts, such as the console, are made from hard, decorative woods, such as mahogany or oak. Wood is also used to make some of the pipes. Woods used for pipes include poplar and mahogany. Most pipes are made from metal. Metal pipes are most often made from alloys containing various amounts of tin and lead. Pipes may also be made from other metals, such as zinc and copper. 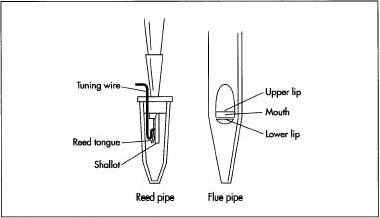 The vibrating reeds inside reed pipes are usually made of brass. Various small components, such as screws and bolts to hold parts of the action together, are made of steel. Other small components may be made of other materials, such as plastics and ceramics. Electronic organs require semiconducting materials, such as silicon and germanium, in order to manufacture the electrical circuits which produce the sound. Every pipe organ must be individually crafted. Because only very small pipe organs are movable, the instrument must be able to produce the best possible sound in one particular location. The organ builder inspects the site where the organ will be used. The acoustics of the location, as well as its physical dimensions, must be considered. The visual appearance of the pipe organ must be as beautiful as the sound it makes. Locations for pipes are selected with both factors in mind. Sometimes dummy pipes that do not actually produce sound are installed strictly to improve the appearance of the instrument. The amount of money that a client is willing to spend for a pipe organ has an important influence on the design, such as the number of pipes that will be installed. Often a client will consider designs submitted by several organ builders, and will select the one that best supplies the desired characteristics within a specified budget. 1 Lumber arrives at the pipe organ manufacturer and is inspected for flaws. It is then stored for about six months to allow it to adjust to the local climate. This avoids having the wood split or crack after it is shaped into pipes. Precision woodworking equipment is used to cut the wood to the proper size and shape. Powered by a rotary blower, a mechanical pipe organ creates sound by linking the console to the valves which control the Row of air to the pipes with cranks, rollers, and levers. The blower moves air through the wind trunk to the wind chest. Stop knobs open and close specific rows of pipes. When a row is open, the air can flow from the wind chest to the pipes as the keyboard is played, creating sound. Pipe orgons utilize two types of pipes. About four-fifths of the pipes in a typical pipe organ are flue pipes. A flue pipe consists of a hollow cylinder with an opening in the side of the pipe. The rest of the pipes are reed pipes. A reed pipe consists of a hollow cylinder, containing a vibroting strip of metal, connected to a hollow cone. organ manufacturer in the form of sheets of the proper size and thickness. Sheets made of alloys of tin and lead are usually made by the pipe organ manufacturer. This is because small changes in the exact amounts of tin and lead present may cause large changes in the sound of the pipe. More tin tends to produce a brighter sound. More lead tends to produce a heavier sound. 3 Tin and lead are carefully weighed on accurate scales and mixed together in the desired amounts. The mixture is heated in an oven until it melts into a liquid. The molten alloy is poured into a large, shallow cooling tray. The metal cools into a sheet, which is removed from the tray. The exact amount of liquid that is poured into the tray determines the thickness of the sheet, which will affect the sound of the pipe. 4 The metal sheet is cut to the proper size. It is then bent around a wooden mandrel in the shape of the pipe being made. The sheet is hammered and rolled around the mandrel until it is shaped into a pipe. The seam, where one edge of the sheet meets the other edge, is smoothed and soldered. The pipe is then cut to the proper length. 5 For flue pipes, an opening of the proper size, shape, and location is cut into the side of the pipe. For reed pipes, a strip of brass is installed in the correct position. Small adjustments in the opening or the reed are often needed when the pipe organ is completed. 6 Manufacturing the console, the action, and the wind chest is a long, slow, difficult process. Each of the thousands of wooden parts which make up a pipe organ is carefully carved using precision woodworking equipment, including joiners, sanders, and saws. Highly accurate drill presses are used to drill thousands of holes, each of which must be in the correct position to allow the pipe organ to operate. Wooden parts that will be visible are carefully polished smooth and given a protective, transparent finish, allowing the natural beauty of the wood to be seen. The keys, also carved from wood, are covered with layers of black or white plastic. 7 The various components, except the pipes, are assembled in order to test the action. A small pipe organ may be assembled where it is built, but most pipe organs must be assembled and tested in the place where they will be used. After the action is tested, the pipes are installed, tested, and adjusted. Raw materials are inspected before the process of building the pipe organ begins. Wood must be dry, evenly grained, and free from cracks or splits. Sheets of metal alloy must contain the proper amounts of each metal and must be of the proper thickness. Constant visual inspection of all parts is necessary as they are built. Before the pipes are installed, the console and action are tested to ensure that all mechanisms work properly. This procedure also blows dust out of the many holes drilled in the action that prevents it from causing problems later. Each pipe is tested for sound quality one at a time. The sound of each pipe is also compared to the sounds of its nearest neighbors. Then, an entire rank of pipes is tested and compared to neighboring ranks. Small adjustments are made as necessary, and the tests are repeated. Electronic organs will continue to reproduce the sound of pipe organs with greater accuracy. The most critical factor in this process will be improvements in sampling technology. Sampling involves converting sound into digital information, storing this information, then retrieving the information from memory and using it to reproduce the sound. Electronic organs will also make increasing use of Musical Instrument Digital Interface (MIDI) technology. MIDI technology allows electronic instruments of various kinds to work together and with computers. MIDI technology could allow electronic organs to reproduce the sound of almost any instrument, as well as producing sounds that have never been heard before. On the other hand, many organ builders are showing more interest in creating instruments similar to those used prior to the nineteenth century. These pipe organs are better suited to playing music from the Baroque and Classical periods than organs built using designs developed during the Romantic period. Perhaps these two seemingly opposite trends will be combined to accurately reproduce sounds which have not been heard for hundreds of years. Sonnaillon, Bernard. King of Instruments: A History of the Organ. Rizzoli International Publications, 1985. Williams, Peter. A New History of the Organ: From the Greeks to the Present Day. Indiana University Press, 1980. Webster, Donovan. "Pipe Dreams." Smithsonian (July 1997): 100-108. "Pipe Organs and Music." http://www.orgel.com/home-e.html (September 3, 1998). The largest organ in the world contains 32,000+ pipes and is located at Boardwalk Hall in Atlantic City, New Jersey. Since pipe organs are so expensive, most of the time keyboards are not covered with black and white plastic, but with various natural materials such as ebony, rosewood, maple, boxwood, bone, or even mammoth tusk. Since this is an article about pipe organs, why are there references to electronic organs throughout the article? Surely these belong in a separate article about electronic organs, which have little in common with pipe organs.